A burger that combines the two greatest foods ever known to man, pizza and burgers, is back again this year through the end of the month at Slater's 50/50 in Southern California. That's right: pizza and a cheeseburger on a bun from the people that brought you the 50% ground bacon, 50% ground beef burger. This Pizza Burger isn't just your typical attempt at colliding the two amazing foods, which is mostly you trying to wrap your slice around a burger. It's a full-fledged hybrid made with a 50% ground beef and 50% mild Italian sausage patty topped with marinara, fried mozzarella, and held together — albeit temporarily — with a toasted garlic aioli brioche bun, according to Slater's. And just like pizza, they're letting you customize the toppings to mimic your favorite pies — like a Hawaiian with Canadian bacon and grilled pineapple, a pepperoni with pepperoni slices, and a supreme with black olives, green peppers, sautéed mushrooms and pepperoni. 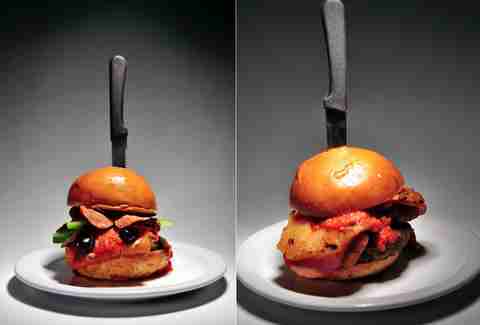 Unsurprisingly, the Pizza Burger is Slater's most popular burger of the month and that's why they keep bringing it back every year, spokeswoman Shelby Lopaty told Thrillist. 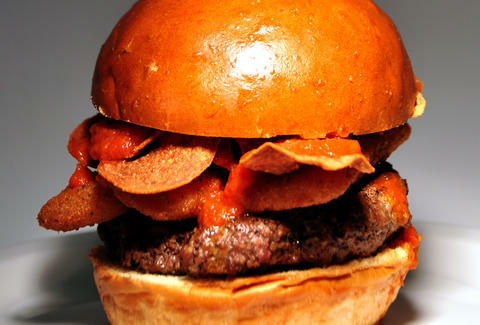 Because pizza on a burger, duh! Tony Merevick is Cities News Editor at Thrillist and loves nothing more than a nice big pizza or a giant cheeseburger, let alone the two combined into one. Follow him on Twitter @tonymerevick.